New data released by the UK’s leading price comparison website, MoneySuperMarket, reveals a further drop in the price of car insurance, with the average cost of a fully comprehensive policy falling £70 (13 per cent) in the past year, from £553 to £483. However, despite prices tumbling in the short term, MoneySuperMarket analysis shows that, over the course of the past five years, average premiums have risen significantly (17 per cent), from £411 to £483. The data is based on analysis of millions of car insurance quotes run on the MoneySuperMarket website in the last 12 months. The recent drop in premiums can be attributed to a number of factors, including the Government’s u-turn on the Ogden discount rate and a crackdown on fraudulent whiplash claims. Motorists in Chelmsford have seen their premiums fall the most over the past year (18 per cent), from £516 to £423 – a reduction of £93. 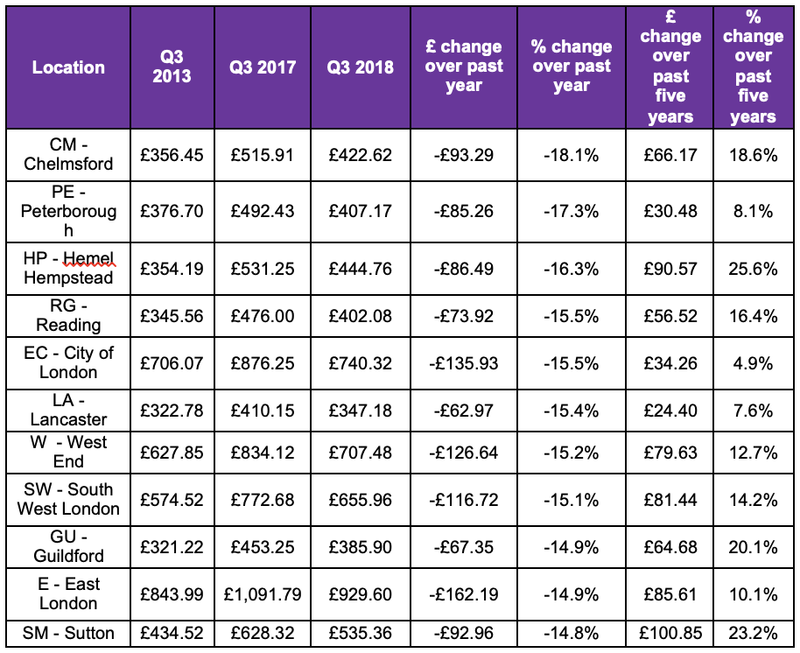 Those in Peterborough and Reading have also seen large drops since September last year, with premiums tumbling by 17 and 16 per cent respectively. Looking back over the last five years, those in Dundee have been impacted most by fluctuating prices, with the average cost of a fully comprehensive policy rising 35 per cent from £268 in 2013 to £363 now. Other areas with significant increases include Inverness (35 per cent), Falkirk (34 per cent) and Exeter (34 per cent). East London remains the most expensive place to insure your car, with the cost of a fully comprehensive policy now standing at £930, while the Isle of Man is the cheapest at £285. Over the course of the past year, prices have fallen across almost all regions and age groups, but younger drivers are the biggest beneficiaries. 17-19-year-olds have seen their premiums fall a staggering 28 per cent in the past year, from £1392 to £1003. Other age groups have also experienced substantial drops, with costs falling nine per cent for those in their 30s and seven per cent for those in their 40s. Women have seen the average cost of a fully comprehensive policy drop significantly over the past year (17 per cent) from £515 to £429, while men have seen a nine per cent fall, from £585 to £531. Despite insurers not legally being allowed to take gender into account when calculating an individual’s premium, there’s still an obvious difference in price. Looking at costs over the past quarter, prices have fallen again – but to a lesser extent. The average fully comprehensive policy cost decreased from £495 at the beginning of the quarter, to £483 at the end of the quarter. Tom Flack, Editor-in-Chief at MoneySuperMarket, commented: “The significant drop in premiums is great news for motorists across the UK. Younger drivers, who traditionally pay the highest prices, can take comfort as the cost of driving continues to decrease. In 2017, insurers hiked prices significantly to provide larger pay-outs to victims of accidents after the way that personal injury compensation payments were calculated. However, after a government u-turn, these rises have been steadily put into reverse. MoneySuperMarket’s Car Insurance UK Price Index allows drivers to see how much car insurance costs in the UK, based on over six years of data and millions of customer quotes.